Independent authors believe every self-publisher is a revolutionary. Gatekeepers in traditional publishing think self-publishers are losers, at least until those same losers use their self-publishing success to humbly petition for a book deal. Vanity publishers insist all self-publishers are overlooked geniuses, and happily back up that assertion with high-priced services and promises they never intend to keep. All of these definitions are unhelpful at best, self-serving at worst. In order to talk about self-publishing with any legitimacy we need a way to differentiate among self-publishers that is meaningful and objective. 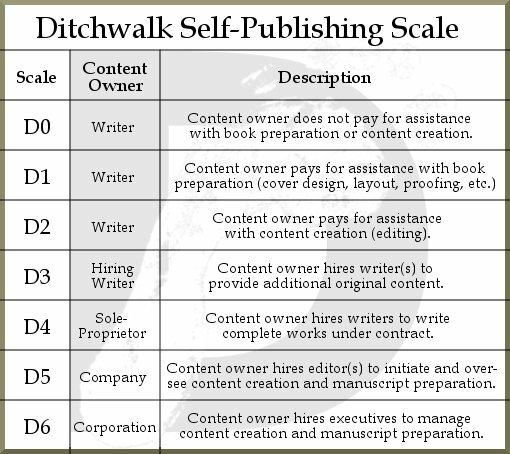 For that reason I created the Ditchwalk Self-Publishing Scale, which uses rising levels of production complexity to categorize self-published authors. To see the Ditchwalk Scale in action, we’ll follow a writer named Patrice as she transitions from category to category, cutting a self-publishing swath deep into the heart of the publishing industry. Patrice writes a book. She tries writing query letters and submitting chapters to agents and editors, but tires of the condescension and interminable delays. Patrice looks at the available self-publishing options, checks her bank account, and decides she has no choice but to do everything herself if she wants to make her work available to readers. While preparing her book Patrice gets cover-design software help from a friend of a friend. She also has several friends read the book for typos and usage errors, and gets e-book and print-on-demand (POD) formatting help from online forums. Because she does not pay anyone to help create her self-published work, Patrice is a D0 self-publisher on the Ditchwalk Scale. Patrice’s self-published book does well. It doesn’t bring in enough money to pay the rent, but it’s enough to encourage her to write a second book, which she does. When she’s ready to publish her second title Patrice decides she wants professional help. She learned a lot publishing her first work herself, but with her second title she wants a more professional look and feel. Patrice hires a cover designer, and a professional proofreader to check her text before she locks it down. Patrice is now a D1 self-publisher because she paid people to help her prepare her book for manufacturing. Patrice’s second book gets buzz but also draws criticism. She is recognized as a good writer, but there’s general agreement that the pace of the book might have benefited from tightening. Patrice takes the criticism to heart. She realizes she needs trained eyes not only on her cover but on her content as well. When she finishes the first draft of her third title Patrice hires a freelance editor to help overcome blindness to her own work. Because she hired someone to help shape the content of her work, Patrice is a D2 self-publisher on the Ditchwalk Scale. Patrice’s third title receives solid critical response. Even better, it prompts renewed sales of her first two titles, generating a fair amount of income for several months. While contemplating her fourth book Patrice realizes she can tie it in with an upcoming cultural event. When Patrice outlines the book and works up a schedule, however, she discovers she won’t be able to finish the book in time to take advantage of the opportunity. In a moment of inspiration Patrice decides to hire another writer to help her. The subcontracted writer will do research and write several first-draft sections of the time-sensitive title while Patrice works on the rest of the book. Patrice will then revise the entire work in her own voice and rush it into production using the team that helped produce her previous titles. Paying someone to write original content for a book she is authoring makes Patrice a D3 self-publisher. Patrice’s time-sensitive title brings in considerable cash. Patrice acknowledges the contracted writer’s contribution both in the book and in interviews. Excited by the possibility of replicating this success Patrice lays out a book series that takes similar advantage of predictable cultural moments. While she recognizes that there’s a risk in launching a series, she knows she can subcontract other writers to write part or all of each first draft, leaving her free to provide overarching editorial control while also working on her own book. After weighing the pros and cons Patrice decides to go a step further. She starts a small press and hires writers to write first drafts in the series using stepped contracts, with the intent of keeping them on as the credited writer if they do a good job or she runs short of time to finish the books herself. Hiring other writers to write books under her editorial control makes Patrice a D4 self-publisher on the Ditchwalk Scale. Some of Patrice’s sub-contracted titles pan out, others flop. Patrice learns from the experience and finds herself contemplating even more ideas for books. She maps out several possible schedules for the coming year, but no matter how she juggles titles and writers she comes up short of time to write, edit and release those books. Patrice realizes she needs to start a dedicated business with in-house editors overseeing aspects of projects that don’t need her direct supervision. For those titles that Patrice and her staff originate and maintain editorial control over, Patrice is a D5 self-publisher. Patrice takes her company public and retires from day-to-day control while still maintaining a financial interest. The board of directors hires a new CEO and expands aggressively. Some projects come from agent submissions, some are collaborations with bankable industry names, but a fair portion of the books her company publishes are developed in-house, in keeping with Patrice’s established practices. Because she maintains a financial interest in her publishing company, Patrice is a D6 self-publisher for those titles developed in-house. To see why the Ditchwalk Self-Publishing Scale reflects reality — and did so even before self-publishing came to the masses — consider what it means to be published. If you write a book and Knopf publishes it to critical acclaim, you’re published, not self-published. If Boris from Russia opens a publishing company with profits from his murder-for-hire business, and publishes your book at a massive loss because it allows him to launder his blood money, you’re published, not self-published. If you have a rich aunt with social connections in the publishing industry, and you whine long enough to get yourself a small book deal for a work that must be ghostwritten in order to protect the professional reputations of all those involved, you’re published, not self-published. No matter how you approach the question of what it means to be published, the only thing that actually matters is that the publisher — the actual legal entity that produces the book — is separate from you. If you write a book and somebody else produces/manufactures that book (without charging you up-front money, which would make them a vanity/subsidy press) then you’re a published author, not a self-published author. On the other hand, if you create the contents and you make the book, then you’re self-published, no matter how complex ‘you’ as a legal or business entity may be. Implicit in the idea of publishing and self-publishing is the question of authorship. Because a writer is usually credited on the cover of a book, authorship is often assumed even when it’s not an accurate description of the writer’s role on a project. When you see “Ernest Hemingway” on the cover of “The Old Man and the Sea”, you can reasonably assume that Hemingway was the author of that title. But when you see “Suzy Silly” on the cover of “The Cretin’s Guide to Calico”, it’s not necessarily the case that Suzy is the author of the book, even if she wrote most of the contents. Why? Because authorship is defined by the creation and ownership of a work. If you’re the writer of a work but you don’t own that work then the question of authorship becomes murky. Conversely, a writer who self-publishes an original work is unambiguously the author because that writer both created and owns that work. The common assumption about traditional publishing is that a writer writes a book which is then submitted to various publishers for consideration. If a publisher likes the work a financial deal is struck in which the original writer retains all rights of authorship because they originated and executed the idea. Anyone who has a passing familiarity with the publishing industry knows there are many projects which do not meet this test of independent authorship. For example, who is the author of A Shore Thing? Is it Nicole “Snooki” Polizzi? Is it ghostwriter/collaborator Valerie Frankel? Is it the agent, editor and/or publisher who pitched and brokered the deal? Who had final editorial control over the book? Who owns the contents? Any of the above? Does it even make sense to talk of authorship in cases like this? On the other hand, if you’re hired to write a book, and you can be told to make changes, and you can be fired if you refuse or fail, then I don’t think you’re the author of that book. Your name may be on the book as the writer, and you may claim authorship in your bio, and you may be able to defend that claim because nobody else wrote the words in the book, but relative to someone who creates and executes an original idea themselves, I think it’s clear that your contribution is less. Throw in the test of ownership and I think the issue is decided. If you’ve spent any time observing the publishing industry you’ve inevitably heard a project described as in-house — meaning it was initiated by an editor or someone in management at the publishing company that produced the work. No matter who the publisher hires to write the words for an in-house title, is not the admission that something was developed in-house proof that such works are literally self-published? If a writer can self-publish a book even after hiring a cover designer, proofreader, designer, editor, marketer, publicist, accountant, tax lawyer, estate lawyer and chauffeur, how does merely hiring a writer (or ghostwriter) shelter a publisher from the charge of self-publishing if the publisher controls and owns all aspects of the resulting work? Isn’t that the very definition of self-publishing — albeit abstracted in both a business context and as a collaborative process? What the Ditchwalk Scale shows is that when the owner of a title hires others to write all or part of the contents under contract, and that same owner also manufactures the resulting work, that person does not get to claim that the work was published by that business. Rather, the work was, by definition, self-published. What publishers have been saying as long as publishers have been in existence is that creating and self-publishing books is okay for them, but not okay for you. Yet hiring others to do work on a title doesn’t determine whether a work is published or self-published. The only thing that matters is whether publication is bankrolled by the content owner or by a separate business. By that definition, many of the books published around the world are self-published by publishers in exactly the same way that independent authors are now self-publishing their own work. The only difference is a difference in scale. That was an enlightening article, very useful to me, as I am considering self publsihing with hired help for developing the manuscript from editors. I’m glad you liked the post. I learned a long time ago that it’s impossible to have a rational discussion if all parties aren’t using the same definitions. My hope is that the Ditchwalk Scale moves us all closer to a common understanding of what it means — and doesn’t mean — to self-publish. Thanks for the scale. That helped clarify the process (and to-do list). As a first time self-publisher of a novel that was previously trad published, I’m D1. 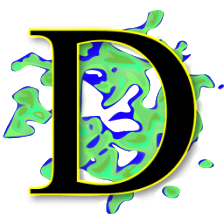 When I self-publish the next novel, I’ll be D2. I’m a little confused about D3. I write fiction and can’t imagine feeling authentic if I let someone else draft my novel,even after giving credit to the draft-writer. Is D3 for non-fiction writers only or am I missing an accepted self-publishing philosophy for fiction writing? The scale was written to apply to both fiction and non-fiction. I don’t know that it’s common for fiction writers to subcontract work to other writers, but I do know that it happens. As to who might do something like this, it would be someone who sees fiction as a product to be sold. Someone like yourself (or me) who values authenticity, artistic integrity, and the journey of writing as much as the destination, would never do something like that. In this case Patterson is letting other writers do the heavy lifting (original work is always more difficult than revision or adaptation), then he’s putting his name on the book — if not taking ownership directly. I can also think of an Academy-Award-winning screenwriter who worked in a similar way. He was known to have access to top-line producers, so young screenwriters were always willing to write a first draft (or second, or third, or tenth), then let him put his name on the script. To my mind this is an ugly (if not fraudulent) way to do business, but only because of the tendency to confuse authorship with writing. Authorship — the thing you’re interested in — is one way to write books. Mining needy unknown writers for original material, then obscuring or lying about your own contribution to the final work is another. Now that’s a helpful way to differentiate between rank amateurs and embryo professionals. We have groups of D1 and D2 writers here in Auckland NZ who are trying to devise a recognised quality standard in order to promote our work. This scale is one step in the right direction and I hope it sweeps the world! I’ll certainly do my bit to spread the word. Other suggestions for measuring book quality are very welcome. I agree that quality is a big issue for self-published authors (at all levels). It’s not necessarily integral to sales or commercial success, but it still matters. In my own experience, the biggest bottleneck I face as a self-publisher is the lack of reliable and recognized reviewers that I can submit my work to. Most of the people who review books are enmeshed in the traditional publishing industry because that’s where the eyeballs and prominent authors are. Interesting categorization. Not sure it works for fiction beyond “D2”. By “D3” your imaginary writer is no longer a writer, but a commissioning editor, and only continues to move further away from writing with each new category. Before this ebook wave there were (and still are) people obsessed with getting a publishing deal. Publishers had all the power, and that power was unpredictable, but a publisher’s benediction was the be all and end all for some. Your scale reads like the fantasy of these desperate-to-be-published, one where they get to be on the other side of the deal where all the power is. “D3” is even labelled “The Player”. Only when Patrice starts commissioning other writers does she start participating in the “game”. Which implies that according to this scale, the game was never writing, it was publishing. Given that each step is seen as a progression, it is also saying that publishers are intrinsically at a higher level of quality and value than independent authors, with the giant multi-national, publicly traded publisher at the very aspirational peak. I guess what I am trying to tease out here, is that this scale is really about independent publishers, rather than independent authors. Independent authors, those who see themselves as authors, writers devoted to the art/craft, don’t need to go above your “D2”. And given the values expressed in the scale noted above, I think they should be explicitly excluded from it. For anyone who dreams of becoming an independent publisher, or more, the scale is a good and clear ladder of the steps they need to take in order to haul themselves up by their bootstraps. We need more independent publishers, but the independent publishing segment also needs more, and better, independent authors. Our messages should be that they can just write and publish, write and publish, not that they should aspire to publish, publish, publish. A very thought-provoking list. Have you considered adding marketing efforts to your definitions? The scale is first and foremost concerned with demolishing the myth that a traditional publisher cannot also be a self-publisher. All of the functions of publication — including writing — can be outsourced, either by the original writer/author (as is traditionally the case in self-publishing), or by a controlling legal entity (as in the case of traditional publishing). To talk about self-publishing as inherently only applicable to individuals is simply a fraud perpetuated by the industry. I don’t agree that, “By ‘D3’ your imaginary writer is no longer a writer…”, but I agree with the gist of your point. At D3 the writer is still writing most of the original content, and depending on circumstances might even make the case for a claim of authorship. Clearly at D4 your point about writing holds, but note: the responsibility for all publishing functions has not changed from D0. Indeed, the responsibility to meet the demands of publication do not vary from D0 to D6, no matter what you call the person/entity doing the publishing, and no matter who is creating the original content. I considered touching on marketing but decided against it. First, it’s too variable. Traditional publishers with deep pockets may decide not to spend money on one title while shoveling money at another. Second, the only aim of marketing is to increase sales, meaning the applicable metric is not one of authorship or writing or publication, but money. Given that celebrity relates more to sales than anything else, and has nothing inherently to do with authorship, I decided that the whole issue was tangential at best. Good points. I believe I mis-interpreted your intention for this list. Self-publishing has got some historical baggage, and the traditional publishing industry is using it to beat the independents down. I think we need some re-framing of the publishing process. The term “self-published” needs to die, and we need to move towards “independently published”. Every author and independent publisher needs to shift to this terminology. In the music industry, putting out your own LP or CD gets you respect. If you were putting out cassettes with hand lettered inserts you could still be legendary. You were independent. Maybe this is because the music industry had a reputation of screwing over musicians, so there was an audience that appreciated the motives and generated the necessary anti-establishment press/rhetoric/attitude/etc. That hasn’t happened in publishing. Possibly because unlike musicians writers don’t have the performance option. You can’t get a deal, but you can still perform, people can still hear your music. Up until recently, if you were a writer and didn’t have a deal, you didn’t have an audience. Your only choice has been to play along, accept low royalty rates, terrible return terms, etc. Traditional publishers laud themselves as gatekeepers, or curators, making sure only the best writers get through to the reading audience. But a gate works both ways. Traditional publishing, due mainly to the expense of book distribution, has also been keeping the audience from the writers. Now traditional publishers are trying to keep control over that same gate, but the barriers to book distribution are gone. All they have left is their checkbooks and reputation. The checkbooks are shrinking, so they are having to rely heavily on their reputation, which requires elevating themselves above the independents by denigrating “self-publishing”. Your list is good ammo. And with concerted effort independent authors and publishers could take traditional publishers’ solitary attack away from them. I think you’re right about the need for re-framing. Over time I think trad publishers will be part of that process because ‘self-publishing’ will replace the function of the slush pile — if not also the brokering/sifting functions of agents. It’s pretty hard to look down on self-published authors when you’re promoting them. And that’s particularly true for self-pubbed writers who gain enough celebrity to make trad publishers pay attention. Great post, Mark. It’s always helpful to get a little refresher on some of the functional aspects of publishing and how they should be properly defined. Terms often get bandied about to the point where they lose their power to hold any meaning. I would argue, however, that the process you delineate doesn’t have to necessarily evolve linearly or require each step as you’ve outlined. An individual may enter at a “higher” step or skip steps in their evolution. Saul, I agree that you don’t need to progress step-by-step. My point was really to show that there’s self-publishing continuity from the pure independent all the way up to the corporate publishing house. The idea that self-publishing is only for the lone writer is simply wrong: big companies self-publish all the time, so the label should apply equally. In a very short amount of time I think people have recognized that fact, which is why self-publishing suddenly has almost no associated stigma. Reading this gave me chills, because, as you can see… I am Patrice. I guess I’m past your D0 and D1, since I used a professional cover artist for my first self-published book, and got a friend to do the copy-editing. It is doing very well, I’m thrilled to say! I have three short stories out as well as my first full-length novel, and I’m now also publishing others, which I guess makes me a small press. But they are writing under their own names, not mine. Thanks for a fascinating examination of the various steps ahead… and all the possibilities. What I’m really glad about, though, is that you’re getting your writing out and not waiting for anybody else to give you permission. Whatever you need to get the job done (and can afford), I say do it. And thanks for helping other people get started, too. Writing should be available to everyone who’s interested in the process, for any reason. agapimenoi mou ma o George Bush antiprosopevi ayoplta tous amerikanous etsi eine oloi kai etsi ton theloun kiafton. Asta na pane kai mh xeirotera na leme emeis pou zoume edo sto America me tetio arxigo. Pantos makari na mou erthete kai tha sas exo na katheste mono kai na zisete esto kai mia mera ton amerikano kai tin nootropia tou. Kala namaste oloi emeis oi alloi laoi pou alaxame aftin tin xora kai ta matia tous se osous epsaxnan to fos vevea. Perimeno fonitiko klipaki diko sas apo tin ekmpompi sas pleaseeeeeeeeeeeeee.